Cutest Dad Gift Ideas from Son and Daughter Ever! Cute Gift Ideas for Dad! Father’s Day is coming up soon and sometimes we can’t seem to find the ideal gift for our dad… something really meaningful and touching, that will come from our hearts! Adorable Dad and Son Heart Stick Figures Collection! I created this cute collection today, but I am not finished! I will keep adding more adorable stuff! 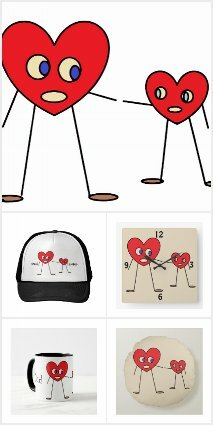 This collection features my favorite products such as pillows, coffee mugs, clocks, blankets, etc… with the most adorable dad and son heart stick figures design! What that means is that each item has a cute dad and son heart-shaped stick figure together! Adorable My Dad My Hero Keychain for Dad from Daughter! We all know that fathers are the very first male figure in a little girl’s life and he is truly her hero! This is a very cute and very affordable key chain for dads! It says ‘My dad my HERO!’ and it shows two adorable stick figures holding hands inside: dad and daughter! This cute stick figure childish family design throw pillow that says ‘FAMILY is EVERYTHING!’ will also make a very nice and loving gift idea for dad! It represents all of you together forever! Will definitely melt daddy’s heart!